Glossy Furniture Grade Pipe with no printing on it. Length is plus or minus 1/8". To order, select the cut size you would like (feet and inches) and quantity of that size and then click on the "add to cart" button. If you need additional pieces of different lengths, click the back button and repeat. The price shown is the price per foot. For 10' sections please contact us for a price. Note: 10' pieces of pipe will be cheaper, however shipping 10' pieces of pipe must go via LTL truck, which is $100-$400 per load depending on your location. 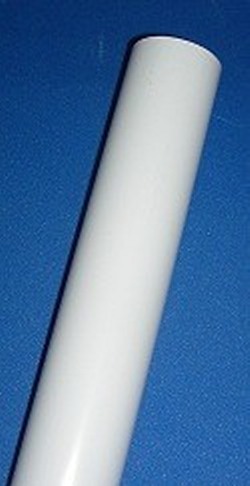 So for small orders it's best to purchase furniture-grade PVC pipe by the foot in the custom length you need. Also orders with any piece over 4' long may have a $10 oversize charge added to your order. It will depend on the rest of your order. If your order of only one piece of rigid PVC pipe is over 4' long, there probably will be a $10 oversize charge added to cover the oversize fee. We will waive the oversize fee whenever possible. Cut pipe or hose are non-cancelable and non-returnable so please be sure you are ordering the correct size and length. The price you see is the price per foot on the custom length white PVC pipes. Thank you. Co-extruded pipe is on the left in the picture to the left. The outer shell on co-extruded pipe is a very thin layer of UV protected, glossy, with no printing WHITE pvc pipe laminated to an inner wall that is virgin material with no filler, but colors will vary. 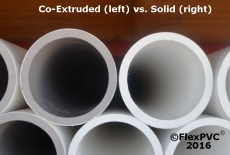 Standard Furniture grade PVC pipe is solid and the entire pipe is UV Protected. Both have no printing on them. If the co-extruded pipe gets hit hard and chips you will see the gray underneath. Other than that there is no difference. Click on the picture for a bigger view.